Associate Professor Takuro Mochizuki of the Research Institute for Mathematical Sciences received the Japan Academy Medal. The Japan Academy Medal gives formal recognition to outstanding young researchers, while encouraging them in their future work. Of the young researchers receiving the Japan Society for the Promotion of Science Prize, up to six who are expected to contribute to the academic advancement of Japan are selected. The award ceremony took place at the Japan Academy on Monday, March 1. Below is a brief introduction of the biography, accomplishments, etc. of Associate Professor Mochizuki. Associate Professor Takuro Mochizuki withdrew from the Kyoto University Faculty of Science in his third year in March 1994 for early enrollment into graduate school, and completed the doctoral program of the Kyoto University Graduate School of Science in March 1999. 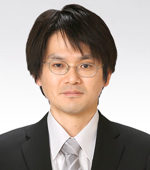 In April of the same year, he became Teaching Associate at the Osaka City University Faculty of Science, then became Assistant Professor of the Kyoto University Graduate School of Science in April 2004, and in May 2008, became Associate Professor of the Kyoto University Research Institute for Mathematical Sciences. This award recognizes his accomplishment in research into the asymptotic behavior of harmonic bundles. The theory of harmonic bundles, which integrates algebra, geometry and analysis, is expanded to high-dimensional and non-compact situations, and as an application, the Kashiwara's conjecture, which states that "categories of semisimple regular holonomic D-modules on projective varieties are preserved by various functors," was proven. The Kashiwara's conjecture predicted that the same results from the Beilinson-Bernstein-Deligne-Gabber is true with a far wider class of D-modules. These results by Beilinson et al. were proven by algebraic methods, and is considered to be one of the highest accomplishments in the field of mathematics in the 20th century. It has many applications. On the other hand, the harmonic bundle is a geometric target which can be reached by solving a non-linear differential equation on a semisimple flat bundle. Much research has been conducted since the 1990s, but for application to the Kashiwara conjecture, it is necessary to know in detail how the harmonic bundle behaves at a singular point. This is a research into the properties of solutions of non-linear partial differential equations, which is considered exceptionally difficult, and was expected to take 50 years to prove. Mr. Mochizuki, with a total of more than 1,000 pages, accomplished this in 8 years. This research result is evaluated extremely highly by scientists within and outside Japan, and this is the reason for his award.